with the #1 NEW GIFT for FISHERMEN! "My wife gave it to me as a gift and the first time we used it, we caught fish on almost every cast. I'm going to need to get a bigger ice chest..."
"We really didn't know what to think of a fish call, but we're always looking for an edge. My son and I decided to try it in the neighborhood pond where we had fished about a half dozen times previously and not had any luck. My son thought we had our own version of the "dead sea." Well on the 3rd cast my son caught a bass. Crazy. Only thing we had done differently was use the fish call. Thank you Fish Call!" "I saw The Fish Call advertisement on Facebook and Google the product to learn more about it. From my Google search, I encountered other links, i.e. YouTube, fishing forums etc., and it caught my interest. Just like any angler out in the water, your mission is to catch fish on your fishing trip. So I placed my order and the Fish Call arrived in two days via Prime shipping. On 4-23-2016, I towed my boat to Hitchcock, Texas and tested the Fish Call. Fishing for 1.5 hours at an 8-10 foot drop of an entrance way, I caught 20 silver perches & 15 croakers, see map w/ details attached. The amazing thing is I could actually see and hear the fishes swimming by the Fish Call. I cast about 2-3 feet away from the Fish Call with a cork & live shrimp, with 5-15 seconds, my cork would get dragged down by a hungry fish. I then got tired of catch silver perches and croakers so I towed my boat to Moses Lake, Texas. At Moses Lake, I fish along the shore close to the flood gate, see map & details attached. The time I began to fish at Moses Lake was around 1:00 pm. The water was calm and slightly murky. I anchored my boat and launched the Fish Call like a football about 15-20 yards behind my boat. 10-15 minutes after I anchored the Fish Call with sound set at medium on #1 Scared Shrimp (same setting at Hitchcock, Texas), I once again heard and saw fishes swimming towards and around the Fish Call. I proceeded to cast my line 2-3 foot away from the Fish Call with a cork & live shrimp, and within 1-3 minutes, the speckle trouts were sinking my cork. The feeling was awesome sitting on my boat anticipating the strikes of the speckle trouts, knowing that the fishes were swimming right next to the Fish Call looking for food. Casting of cork & live shrimp close to Fish Call confirmed their curiosity and the fishes strike. I've never caught that many speckle trouts at Moses Lake the many times I've fished there. I finished up at Moses Lake with 7 speckle trouts, 10 croakers & 1 sheepshead. Sheepshead was released because it looked unhealthy, sorry no picture. If you love to fish and hate the feeling of being skunked on your fishing trip, I recommend the Fish Call. You will catch more fish in less time. The Fish Call worked for me." "I don't have to hunt all over for the fish now they come to me. Love it"
"So far so good, I took this out to the lake for the first time and within a minute of throwing it out on the edge of a floating dock, I caught a small bass directly underneath the fish call! Later in the day I was drifting down the shoreline while dragging the fish call next to my kayak when I noticed a bass circling directly around it. I actually caught both of these instances on my gopro and I'll be uploading a video review in the upcoming weeks when I can take it out for more testing. I was skeptical at first but my first experience using it has left me really impressed." "Ordered one for my dad and he loves it! High quality product that certainly delivers. Would definitely recommend to others." "I used this last Monday on a fishing trip out of Delacroix. I couldn't believe how each one of the 9 redfish my friend and I caught were caught within a 5 foot area of The Fish Call. I am looking forward to many more successful trips with this new toy." "Wow it really works. I feel a bit sad for the easy fish i now catch but my tummy is full. I use a bright yellow anchor line so I don't hook the fish call anchor. I repainted my fish call blue so others don't easily see my secret weapon floating 20 feet in front of me." "Love this product!!! I bought it just to see... And I was amazed on how fantastic this product is!! We were only out for a couple of hours and caught a mess of fish!!! Great product! Highly recommend!!!!!" "I was skeptical and thought it was a hoax, but honestly, when I go fishing, The Fish Call...comes with me.. It really brings them in, within 10-20' of the call. I'm hookin em all. I can't believe it actually works. But it just does. You gotta buy to see for yourself. #TheFishCall #Fishon #Rippinlips"
"On my first day with the fish call I was likely more skeptical than most. It wasn't until lunch that I actually threw it out. We had drifted a small pond with no bites, strange because I had just caught fish there the day before. Well we power poled down to eat some lunch. Before eating I tossed the fish call out on scared shrimp mode. We ate and talked for about 10 minutes, and decided to head to another spot. Before leaving we took a cast towards the fish call. As soon as the corks hit the water they were down and we were doubled up. We caught a few more trout and moved on. We threw the fish call out frequently as we bounced from spot to spot. More times than not we would catch fish close to the fish call. It stays on my boat and I usually throw it out a few times a trip. The claim is not it will make fish appear that are not around. It's not likely you can pull up at a random spot and call in all the fish in the lake. I can with out a doubt claim this when in an area we have caught scattered fish it does seem to call them in closer. My fish call stays on my boat and has become an essential part of my fishing equipment. Anyone that has any doubts my advice would be try it for yourself. For its price compared to the cost of all my other equipment is minimal in cost for the results it has produced." "my cousin ordered 2 one for him one for me online and we went to lake fork in north east texas me thinking he was crazy we caught a lot more channel cat than we wanted to clean we have caught the biggest one at 17 lbs smallest being 2 lbs when we tried without it we didnt get any bites put it back on we started catching fish again i love it"
"We went down to the coast at Corpus Christi, Texas and fished off from the pier at the naval station and we were catching everything under the sun. 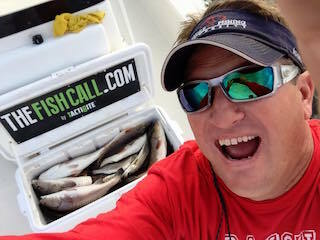 Great thing was the high tide was coming in and that's usually bad for fishing, but with The Fish Call, we loaded up! I couldn't believe the product. It really works....The school of fish that surrounded this product was ridiculous!" "We fished near a man that was catching fish and got about 75 feet from him was not catching fish we thru the fish call in the water and kept fishing about 5 mins later we started catching a few the longer it was in the water the more we caught. We caught crappie and striped bass! "It made a believer out of me..... On the day we used it we had fished all morning and only had one speck in the ice chest, so I decided to give the fish call a try for myself..... Over the course of 1.5 hours we caught 37 speckled trout, redfish, drum, and flounder. And this was after fishing the same spot for 30 minutes without a single bite. This thing is definitely a game changer." "Seriously? Unbelievable is the word that comes to mind. Proven itself in some rather challenging conditions. It does not make fish. However, it does attract them with very impressive results. I have used it to catch Redfish, Spec Trout, Red Snapper, Amberjack, Drum, large mouth bass, cat fish and even flounder. I thank all of you who came up with this idea and product." Check out these Awesome Customer Review Videos!